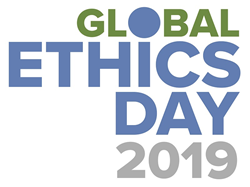 The sixth Global Ethics Day, held on October 16, 2019, provides an opportunity for organizations around the world to hold events on or around this day, exploring the crucial role of ethics in their professions and their daily lives, each in their own way. It's exciting to see more and more people participating every year, not only using Carnegie Council materials but creating their own events as part of a global effort to raise awareness about ethical issues. Inspired by Earth Day, Global Ethics Day provides an opportunity for organizations around the world to hold events on or around this day, exploring the crucial role of ethics in their professions and their daily lives, each in their own way. For more information on how to participate, go to https.globalethicsday.org. "Launched in 2014 as part of our Centennial activities, Global Ethics Day creates a focal point on the calendar to reach our constituents all around the world," says Joel Rosenthal, Carnegie Council president. "It's exciting to see more and more people participating every year, not only using Carnegie Council materials but creating their own events as part of a global effort to raise awareness about ethical issues. This is exactly what we hoped for and we're sure that 2019 will be the most successful Global Ethics Day yet." For Global Ethics Day 2018, there were over 140 activities by organizations and individuals in over 50 countries. Events took place in Asia, Africa, Australia, Eurasia, Europe, the Americas (North, South, and Central America, and the Caribbean) and the Middle East. Participants included professional associations, corporations, universities and colleges across the world, NGOs, and libraries. For ideas, check out all the 2018 activities here: https://globalethicsday.org/ethics-in-action-for-global-ethics-day-2018-140-activities-in-50-countries/. To keep the Global Ethics Day spirit going through the year, in 2018 Carnegie Council teamed up with the Association of Chartered Certified Accountants (ACCA) and CFA Institute to produce a series of interviews with business leaders, titled "Ethics in Business: In Their Own Words." These are being rolled out over the course of the year. View them here: https://www.youtube.com/playlist?list=PLr-zGbuOrvVXF9hH9KWTR1gPI3o8NBhs4. "ACCA asks its members anywhere in the world to adhere to a single global code of ethical conduct, and we feel that's incredibly important." "The last six words of our mission, which I'm passionate about, are ‘for the ultimate benefit of society," and really that's what we're trying to connect finance and investment management to: a sense of purpose." "So if I'm halfway through my tenure and I've got another five years to go, you start to think about, 'What difference can we make in the world through our company, through our products, through our employees?' So you go from being — I'll call it 'tactical'—in just figuring out the job to being strategic, and 'How can I help us live out our purpose?'" "Integrity. I always consider that is the very basic core value of any professional because no matter how smart you are or how capable you are if you have an integrity problem, then that is a big, big problem."